iXCells Biotechnologies is proud to offer human iPS cell lines derived from the human somatic cells (dermal fibroblasts, adipose-derived stem cells, peripheral blood mononuclear cells) from patients with Amyotrophic Lateral Sclerosis (ALS). The pertinent donor information is available upon request (info@ixcellsbiotech.com). These iPS cells are established from a single clone and expanded in feeder-free conditions. The Certificate of Analysis is provided for each cell lot purchased. The cells have been fully characterized for their self-renewal and pluripotency (Figure 1). All the cells provided by iXCells are negative for mycoplasma, bacteria, yeast, and fungi. HIV-1, hepatitis B and hepatitis C.
Normal human iPS cell lines are also available as separate products (Cat# 30HU-002). The currently available diseased specific iPS cell lines are derived from patients with Type 1 Diabetes (T1D), Type 2 Diabetes (T2D), Alzheimers's Disease (AD), Parkinson's Disease (PD) (Cat# 30HU-003), Amyotrophic Lateral Sclerosis (ALS). More disease-specific iPS cell lines are under development. We also provide custom iPSC generation and iPSC differentiation services to meet your needs. 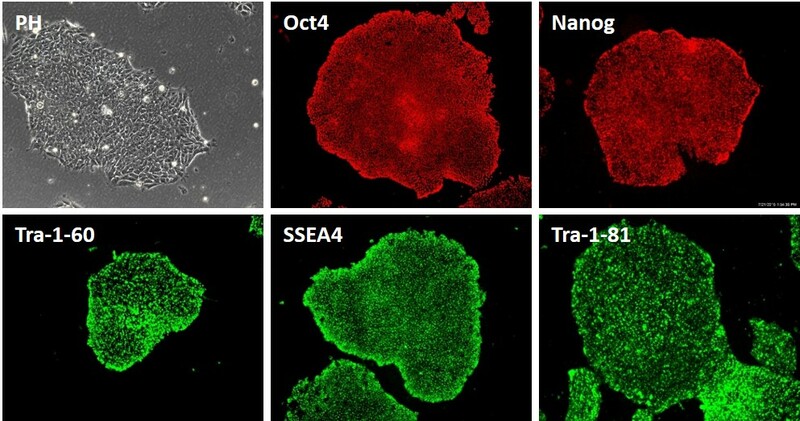 Figure 1. iXCells human iPS cells are characterized by immunostaining with Oct4, Nanog, SSEA4, TRA-1-60-R, TRA-1-81.